By Gavin Howie: Ike Ibeabuchi had all the tools to become one of the real great heavyweights, but he had one major flaw; and that was himself. Born in Nigeria on February 2nd 1973, Ibeabuchi originally intended on joining the Nigerian military, that was until he witnessed Buster Douglas KO Mike Tyson in 1990 and that inspired him to take up the sport of boxing. Ike turned professional on October 13th 1994 by scoring a 2nd round knockout over Ismael Garcia. His first big test would come 3 years later on June 7th 1997 when he faced the undefeated David Tua. Tua had amassed a record of 27-0 with 23 knockouts, and was widely being touted as the next Mike Tyson. This fight now holds legendary status and was a war of sheer brutality, one that Ibeabuchi would come out on top of by way of a 12 round unanimous decision. The rise of Ibeaubuchi had begun… or had it? Only a few months after the Tua fight, Ibeabuchi would find himself in trouble with the law. He was sentenced to 120 days and paid a $500,000 civil settlement after pleading guilty to a charge of false imprisonment. After 13 months out of the ring Ibeabuchi returned to ko Tim Ray in the first round. Ike was back, but his mental status was becoming a cause for concern. He would insist on being called ‘The President’, and had an alter ego where he believed he was the president of the world. 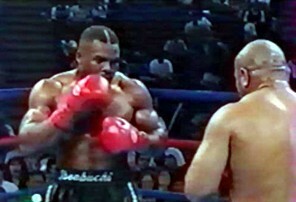 Chris Byrd, who would later go on to become the IBF world champion was up next for Ibeabuchi. The match was set for March 20th 1999. Byrd was a slick southpaw and was also undefeated with a record of 26-0. The fight would be over in just 5 rounds and Ike Ibeaubuchi was now a major contender in the heavyweight division. With a record of 20-0 with 15 knockouts and aged only 26 years of age, Ibeaubuchi looked like he would go on to become one of the most dominant heavyweights the world has ever seen. Sadly this was not the case, and this was the last time we would see Ibeabuchi in the ring again. Following a string of varied offences, Ibeabuchi would serve his best years in prison and wouldn’t be released until he was 41 years of age. Ike planned to make a comeback upon his release, but was thwarted in this due to immigration issues. Ike Ibeabuchi had everything required to succeed in the ring, its just such a shame that his mental frailties got the better of him and eventually defeated him in his quest to become heavyweight champion of the world.